This week was a pretty good week for me. I made some good networking connections at a small business association meeting, had some pretty cool Google+ Hangout/co-working sessions with colleagues in other parts of the world, and had some good interactions on Facebook, Google+ and LinkedIn. All of this left me with a pretty good feeling about what I’m doing and about social media in general. The week culminated with a tweet from a new cyber-friend @CarriesSocial. She tweeted that as a new social media consultant, she was amazed at the generous give and take that goes on between different social media businesses. It was at that point that I really stopped to reflect on how right she was and how, in looking at the big names in Social Media operate, Social Media Karma really does exist. Be Yourself: This is probably the most important rule of Social Media Karma. It means being real, being truthful about yourself, being transparent about who you are and what you believe and by sharing in an honest way, not just for self-promotion. Just like in the offline world, if you are yourself and genuine with others, they will start to trust you and then real relationships can be developed. Be Responsive: Respond to e-mails promptly and with a personal tone. Respond to Direct Messages. Most importantly, respond positively and publicly to @mentions on Twitter. The more you mention others, the more likely they are to mention you in a positive and public way. Be Engaged: By commenting and participating, rather than just being an observer online, you can easily generate Social Media Karma. When you Like other Fan Pages, comment on a status, Retweet, Digg or Stumble a blog or article you are giving people a gift. And it’s usually a gift that gives back. Be Acknowledging: If you refer to anyone, whether it’s on Twitter, Google or Facebook, it’s best to link to them and to their article/blog post. Everybody works hard, whether it’s writing, networking or curating content and everyone wants to be recognized for their efforts. Be Helpful: We are all here to try to make a difference. The more helpful you are, by answering questions, sharing information, providing guidance, the more others will be willing to help you. It’s as simple as that. Be Grateful: The first rule you learned in Kindergarten was to say please and thank you. Manners work in the offline world and they sure go a long way online as well. Thank people for following you, thank them for sharing a post or commenting on an article. Thank them publicly and by name. Appreciation makes people feel like you value their efforts and that they are important. This will, of course, make them more likely to reach out again. 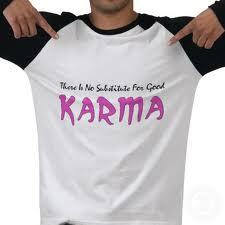 Karma is kindness in practice. Not only do your actions online say a great deal about you but they also say a great deal about how you do business. If you follow these 6 easy steps, you will undoubtedly be able to generate a significant amount of Social Media Karma for yourself. What’s your experience with Social Media Karma?